Greetings from another overtime intermission of Game 1, folks... will it ever end? As some have asked – and thanks for checking in on it – the Page Three sidebar is apparently down, so no need to worry whether it's your machines. For what it's worth, the disruption looks like it's a server issue on the provider side. Hopefully we'll have it sorted out soon... in the meantime, thanks for your patience and, as always, the feed remains available at its direct link with all the usual good, bad and otherwise that zips around the news-cycle at an ever more rapid pace. Speaking of the 140-character world, this beat's top tweeter passed a notable milestone late tonight. 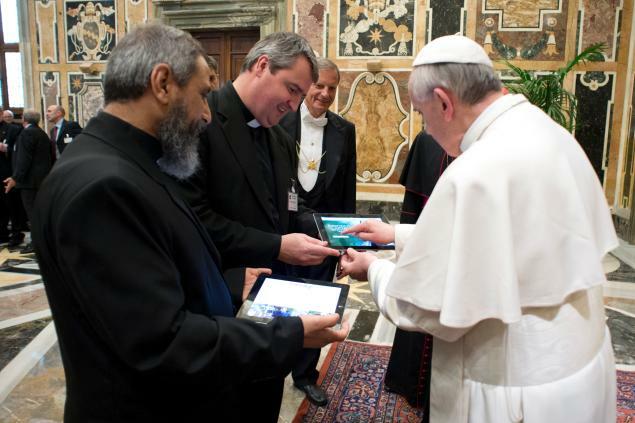 Exactly six months since B16 tapped an iPad to launch @Pontifex into the Twitterverse, for the first time, the English-language feed intended as the medium's papal flagship was eclipsed by its Spanish counterpart, @Pontifex_es, in its number of followers. The rapid growth of the accounts has made the pontiff among the 100 most sought-out people on Twitter – the only figure among the mega-group to be in the mix for less than several years – and second among spiritual leaders only to the @DalaiLama's following of 7.1 million. Then again, one especially enlightened cleric hasn't termed Papa Bergoglio the "Catholic Dalai Lama" for nothing. Back to the game... and the troubleshooting.